So if your husband is a huge beer snob, you’ll understand that any trip out of town ends with a trip to a brewery. While we were in Atlanta we went to Monday Night Brewing. This time we stopped by Wicked Weed. I absolutely loved the decor. Everything is based on King Henry VIII who said hops are “A wicked and pernicious weed” destined to ruin beer. The men’s bathroom had his portrait and the women’s bathroom had portraits of his three wives. We sat at the bar downstairs in the tasting room which was open to an outdoor courtyard with corn hole and various table arrangements. 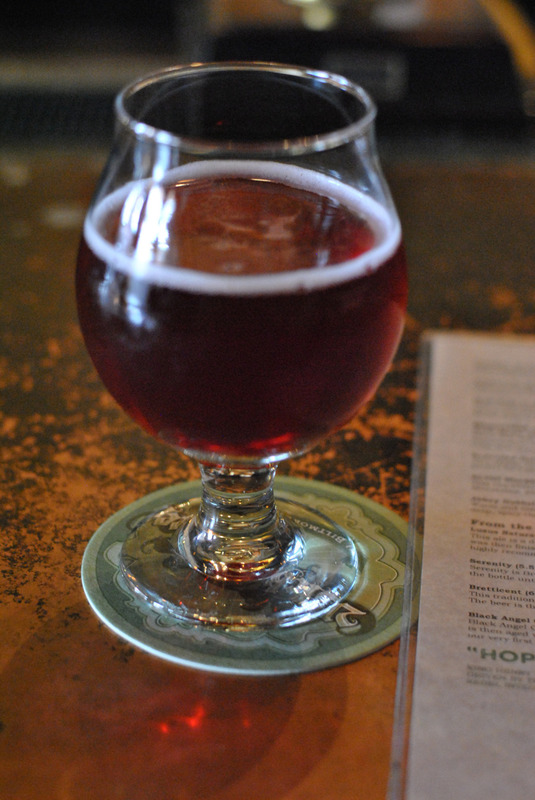 I ordered the “Beautiful and Belgian” XLVIII Blackberry Sage Saison. It was so drinkable and delicious! Someone else at the bar ordered brussels sprouts and I’d forgotten from last fall how much I miss them as part of our weekly menu. I almost wish we had just eaten at the brewery but maybe next time we will stay longer! While we were there the staff announced that their Pernicious IPA actually won silver at the Great American Beer Festival which resulted in lots of cheering and revelry from the crowd. Stop by next time you’re in Asheville or headed out for a concert at The Orange Peel.